T Anthony Castonzo vs. Edge Jerry Hughes – The Colts will look to establish their rushing attack early and often against a Bills team that ranks 25th in the league defending the run. A key component of their run game is their veteran left tackle. Castonzo ranks second at his position with an 85.7 run-block grade in 2017, and his 89.3 run-block grade against the Jaguars last week ranked third. The former first-round pick is also vital to the team’s offense in pass protection. Castonzo allowed four pressures against Jacksonville, but he has not allowed a sack or hit in his last four contests. His 95.2 pass-blocking efficiency currently ranks 24th among tackles. For the Bills, Jerry Hughes has flipped the script this year while deviating from his career averages. Usually a stout pass-rusher, Hughes ranks 45th among edge defenders with an 8.2 pass rush productivity. Meanwhile, his 90.8 run-defense grade ranks third at his position, and his 8.3 run-stop percentage ranks 10th. QB Jacoby Brissett vs. Bills cornerbacks – Jacoby Brissett did not have his best outing against the Jaguars last week, earning a 53.9 overall grade. The quarterback did not complete a pass on two deep targets, throwing an interception in the process. Perhaps surprisingly, Brissett had just a 51.8 passer rating on throws without pressure. The first-year Colt has flashed at times during the 2017 season, though. His 74.5 adjusted completion percentage is just shy of the top-10 quarterbacks, currently placing for 11th. The young signal-caller will face a still test from a solid Bills secondary this week. Cornerback Tre’Davious White’s 90.5 overall grade ranks second among rookies and fifth overall. Brissett may want to target E.J. Gaines or Leonard Johnson instead. Both players rank inside the bottom-12 among cornerbacks in terms of coverage snaps per reception. They’re averaging 8.9 and 8.1 snaps, respectively. G Joe Haeg vs. DI Adolphus Washington – This matchup pits two players against each other that have labored through inconsistent campaigns for their respective teams. Haeg was fairly effective playing at right tackle for Indianapolis but shifted back to guard during the last two weeks when a healthy Denzelle Good returned to the line-up. In those two games, Haeg has surrendered 11 total pressures. That is the same amount he allowed in five games at tackle before the switch. During his sophomore campaign, Washington has not pressured opposing quarterbacks on a consistent basis, accumulating just four total pressures in 170 pass rush snaps. His 1.9 pass-rush productivity ranks last among interior defenders. 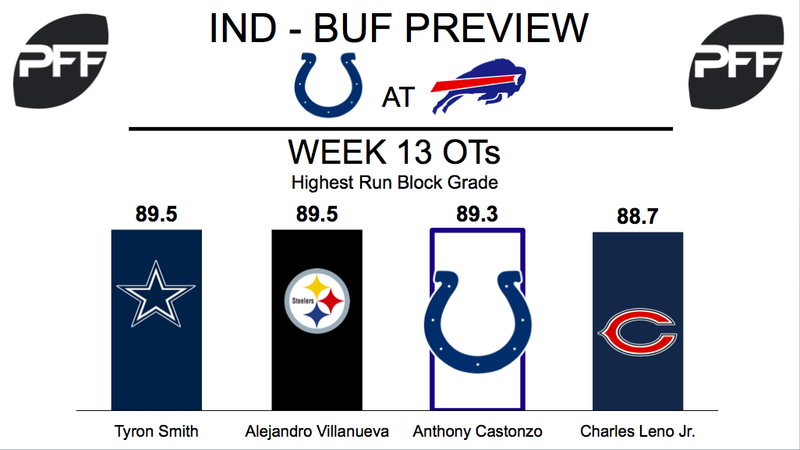 If Washington can find his rhythm this week, however, it will put his defensive line in a good position to slow down the Colts’ offense. T Dion Dawkins vs. Edge Jabaal Sheard – Dawkins has had a great rookie season, as he is currently the 26th ranked tackle with an overall grade of 77.6. Dawkins’ run-block grade of 81.1 is the 15th-highest run block grade of any tackle this season. Sheard has been one of the best defenders against the run this season. The veteran edge defender ranks sixth with a run-defense grade of 89.6. With 23 stops against the run, Sheard has the fourth-most stops of any edge defender, and his run-stop percentage of 8.8 is the sixt- best. TE Charles Clay vs. LB Jon Bostic – Clay has been the Bills’ biggest weapon in the passing game this season. The tight end has the 17th-best receiving grade in the NFL, and his threat rate of 28.5 percent is the third best by a tight end (threat rate shows the number of times an eligible receiver is targeted when there is an aimed pass). Whilst Bostic has been having a career year with an overall grade of 74.9, he has been vulnerable in coverage. Bostic ranks 60th among linebackers with a coverage grade of 43.6. He is also allowing the 11th-highest passer rating in his coverage at 121.3. 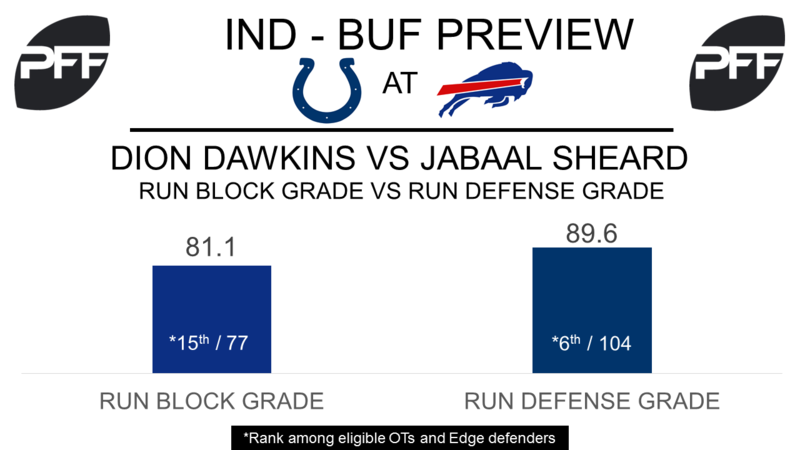 WR Zay Jones vs. CB Quincy Wilson – Two rookies who have struggled to make an impact in their first year will go head-to-head on Sunday. Jones has been Buffalo’s most targeted player this season with 60 targets, but he has struggled with drops. The rookie has the seventh-highest drop rate this season at 16.67 percent. Wilson has only played 128 total snaps this season and appeared in his first game since Week 2 last week versus the Jaguars. When targeted this season, Wilson is allowing a passer rating of 126.4, which is the highest among Colts cornerbacks.